Accommodation in Cape Woolamai, Victoria. On Monday 22nd April 2019 the sun will rise at 07:52 and will set at 18:43. It will be a mild day, with temperatures reaching around 17.2°C. Today is expected to be a dry day, with a very low chance of rain. There will be a gentle breeze in the air today, with a maximum expected wind speed of 12mph. On Tuesday 23rd April 2019 the sun will rise at 07:53 and will set at 18:41. It will be a mild day, with temperatures reaching around 19.2°C. Today is expected to be a dry day, with a very low chance of rain. It will be quite a breezy day, with a maximum expected wind speed of 13mph. On Wednesday 24th April 2019 the sun will rise at 07:54 and will set at 18:40. It will be a mild day, with temperatures reaching around 20.7°C. Today is expected to be a dry day, with a very low chance of rain. It will be quite a breezy day, with a maximum expected wind speed of 13mph. On Thursday 25th April 2019 the sun will rise at 07:55 and will set at 18:39. It will be a mild day, with temperatures reaching around 20.3°C. Today is expected to be a dry day, with a very low chance of rain. It could be quite a gusty day today, with a maximum expected wind speed of 28mph. On Friday 26th April 2019 the sun will rise at 07:56 and will set at 18:38. It will be a mild day, with temperatures reaching around 18.3°C. Some moderate to heavy rain is expected, 6mm of rainfall is possible today. Some quite strong winds are possible today, with a maximum expected wind speed of 52mph. On Saturday 27th April 2019 the sun will rise at 07:57 and will set at 18:36. It will be a mild day, with temperatures reaching around 15.1°C. Today is expected to be a dry day, with a very low chance of rain. It could be quite a gusty day today, with a maximum expected wind speed of 37mph. On Sunday 28th April 2019 the sun will rise at 07:57 and will set at 18:35. It will be a mild day, with temperatures reaching around 15.2°C. Today is expected to be a dry day, with a very low chance of rain. There could be quite a strong breeze in the air today, with a maximum expected wind speed of 26mph. Spend your winter in our summer. A holiday to remember for couples or small families. 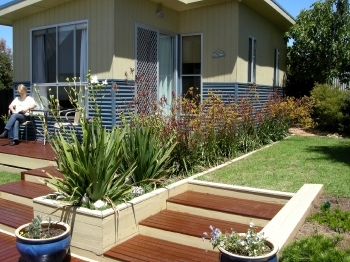 Summerhays Cottage, Cape Woolamai, Phillip Island, Australia, offers self-contained motel style accommodation in a spacious cottage bordered by a tranquil garden with a large deck area. Perfect for two; just right for two + one. Need more space? Ask about our house. Close to beaches, world famous Penguin Parade, amazing nature walks and many other sites and activities.